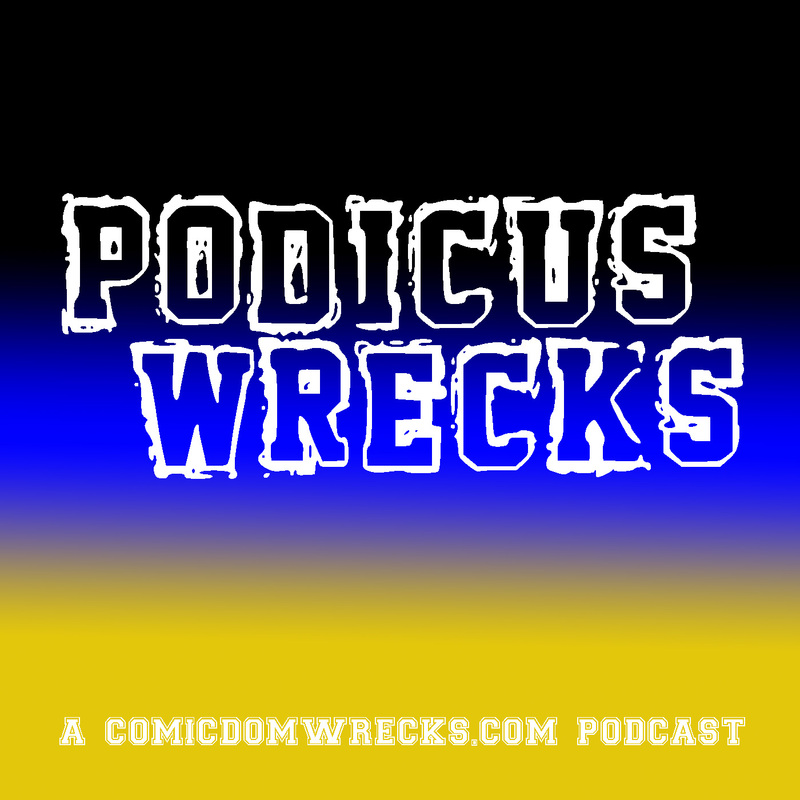 Saturday Morning Cartoons #10 – Comicdom Wrecks! April 7, 2018 J. R.
Welcome back for another installment of Saturday Morning Cartoons. This is our weekly feature where we highlight an episode of a cartoon at a time that should be reserved for cartoons, Saturday mornings. So grab a doughnut, some chocolate milk, and enjoy this week’s entry. For this week’s episode, I returned to Batman The Animated Series, and selected the episode “Almost Got ‘Im,” written by Paul Dini and directed by Eric Rodomski. This is one of my favorite episodes in the series. It’s a villain-centric episode where several members of Batman’s rogues gallery are sitting around a table, playing poker. Trying to impress and outdo each other, they all share a time when they almost got Batman, to prove to everyone else that they have come the closest to taking out the caped crusader. The villains in this card game are Joker, Penguin, Killer Croc, and Two-Face. They start with small talk about Batman, maybe that he’s actually several people that Gordon has on payroll, or that he is hideously scarred. No one wants to hear about Croc’s belief that he’s actually a robot. Ivy joins the party, mentioning that she, like them, is running from the Batman. Croc brings up that you’d think one of them would have gotten Batman by now. That is what starts the storytelling. Ivy goes first. Ivy’s story starts on Halloween, when she rigged hundreds of pumpkins to explode with her poison gas. Her plan is going well, until Batman knocks her into light pole, which brings bulbs crashing down, which ends up starting a fire, and causing more pumpkins to explode. But even then, it was going well enough, because unlike Batman, Ivy was immune to her poison gas. So as she’s coming up on Batman he activates the remote controls on the Batmobile. Ivy tries to escape up a pole, but the Batmobile crashes into it, and she is subdued. Next up is Two-Face. He is robbing the Gotham Mint. He has Batman in custody, and takes his utility belt. This is a brilliant piece of writing, right here. First off, if any villain has been paying attention, the first thing they should always do is take Batman’s utility belt. It should be the day 1 lesson of Evil Villain 101. But that’s not what makes this bit brilliant. It’s the timing of the segments. We just saw in Ivy’s segment that Batman used the utility belt to defeat Ivy, but now, he no longer has it. So as an audience member, we’re left wondering how Batman is going to get out of this predicament. Two-Face knocks Batman out, and straps him to a giant penny, that he’s going to flip. Now note, Two-Face tells Batman that if the penny lands on him, it will kill him. If the Batman ends up on top of the penny, then it’ll just break a whole lot of bones. This is important. Two-Face is about to have Batman launched, when he reaches into his pocket and realizes that his coin is missing. Batman has it, and is trying to use one of the jagged edges of it to cut through the rope. Two-Face sees this, and immediately launches Batman. 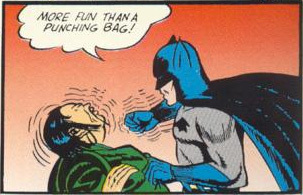 Of course, Batman escapes, and knocks Two-Face hard into bags of coins, subduing him. But what of the still flying penny, you ask? Well, it lands on two of Two-Faces henchmen, who I guess had decided to run off in that direction when Batman escaped. Though, realistically, not certain they would have had enough time to get to the penny’s landing spot, unless they were a long way away from the group anyways. And you know what, the physics of this whole segment don’t make a lot of sense, but whatever. The take away from this bit of ramble is that two henchmen definitely just died. Croc is next. He tells about a time where he was in quarry. Had Batman in his sights…….and threw a rock at him. The others look at him in disbelief for a moment, and then just go about their business. Croc sheepishly comments that it was a big rock. Around my apartment, this may be the most quoted bit from the entire series. Here Croc is, this big, lumbering oaf, and the best he can do is throw a rock at Batman. But as a bit of a muscle head, it fits with what you’d expect from Croc. He’s not going to be the type to come up with a large plan. Up next is Penguin. Penguin had let it be known that he was going to attempt to steal some breading condors from the Gotham Zoo, in an attempt to lure Batman there. Penguin traps Batman in his “Aviary of Doom.” Here, he firsts sends hummingbirds with poison tipped beaks after him. Next, Penguin sends a really large bird after Batman, but he stabs it with one of the hummingbirds. Penguin decides to just leave and fight another day. Lastly is Joker. He mentions that there are many ways to get someone, like his that happened just last night. He shows them a broadcast from where he had taken over a late night talk show broadcast. Joker has Batman hooked up to an electric chair type device, which increases the voltage as people laugh. With a studio audience under the influence of laughing gas, things start escalating. Catwoman comes in to save the day, and Batman is able to escape. Catwoman went after Joker, but she got knocked out by Harley. Croc asks what Joker did with Catwoman, where Joker tells everyone where she is. And then Croc stands up, speaks in Batman’s voice, and tosses Joker aside. It turns out that this entire time, Batman was disguised as Croc, and the entire place was full of the GCPD. To me, this reveal makes Croc’s antics throughout the episode even funnier. There’s a moment when Ivy easily takes him out and steals his chair, and Croc tosses someone in the background to steal their chair. Looking back on Croc’s story about how he almost got Batman, it should have been a clue that it wasn’t really Croc. I may be reading too much into this, but possibly we didn’t see the story in flashback like we did with the other’s possibly because it didn’t actually happen. So that’s “Almost Got ‘Im.” If I ever meet Paul Dini, I would like to ask him how this episode came together. Did they have several crazy schemes that they didn’t couldn’t figure out a longer episode for that villain to use them in? Did they come up with the episode framing, and then think up the crazy schemes, knowing that they’d be used here, and wouldn’t really need to set them up? Either way, it makes for a fun episode.